Staffer: Congresswoman Dingell’s office, how can I help you? Caller: Hi there, I’m a constituent of Congresswoman Dingell, and I have a question for her regarding the inauguration. Staffer: Yes, this is [Name]. Caller: Thanks, [Name]! I discovered in a Click on Detroit article this morning that the Congresswoman is planning to attend the inauguration. I’m calling to ask if the Congresswoman will reconsider her decision, and join with the 30 or so other representatives boycotting it in response to Donald Trump’s attacks on Representative John Lewis. Staffer: Something about respect for the transition of power. Caller: I find it unacceptable that the Congresswoman refuses to take a stand in defense of Representative Lewis. Yesterday I discovered the Indivisible Guide which has guidance on how progressives can use Tea Party tactics to stifle the damage done by a Trump presidency and Republican controlled Congress. The advice seems sound to me. It boils down to focusing attention on your own Members of Congress and paying attention to the things they care about, mainly re-election. I’d like to be part of a local group using these tactics. The link for the listed Ann Arbor group doesn’t work, so… I’ll keep an eye out, I guess? Their action for today is to encourage your representative to boycott the inauguration in response to Trump’s attacks on Representative John Lewis. I’ve called this morning. A decision hasn’t been made yet, but the staffer took my email address. If I don’t hear by this evening I will call again tomorrow. I’ve written up a script to make it easier for the phone shy, like myself. It’s time to strengthen some spines. Caller: Thanks, [Name]! I’m calling to ask, if the Congresswoman will be joining with the 40 or so other representatives boycotting the inauguration in response to Donald Trump’s attacks on Representative John Lewis. Caller: I appreciate that [Name], but I don’t want you to just pass my concerns on. I would like to know if she standing with Representative Lewis or with Trump. If giving the I don’t know what she’s going to do line. Caller: I’m glad to hear that the Congresswoman will be standing with Representative Lewis. I will let my friends, family, and local newspaper know about this. Thank you so much. Good bye. Caller: I find it unacceptable that the Congresswoman refuses to take a stand in defense of Representative Lewis. I’ll be notifying my friends, family, and local newspaper that our Congresswoman doesn’t think it’s her job to represent us or actually respond to her constituents’ concerns. (b) do what those blast e-mails tell you to. When they tell you to call or write your local politician, do that. Every time. As much as possible. If you really want to make a difference, sign up for one advocacy organization for each weekday, and then each weekday evening, before you go to bed, review what that advocacy organization wanted you to do that week and do it. You know, Monday for the ACLU, Tuesday for the National Resources Defense Council, Wednesday for the EFF, etc. etc etc. Ten minutes every day, every weekday. That’ll end up being like 250+ calls / mails / etc. from you in a course of a year. That’s a _huge_ mark you can make. Remember that your local politicians have to decide every week how far to go on any given issue. They way they tell is by counting letters and e-mails. Even if your local politician is on the opposite side as you, you can scare them into _not_ sticking their neck out too far on a given issue. If a Trump-allied politician gets a ton of letters opposing a Pres. elect-Trump priority and only a few supporting it, they’re probably not going to invest too much effort or capital into advancing that priority. Which is a net win for our side. Several advantages to this strategy: (a) no awkward meeting strangers and networking thing, for those of you who aren’t so much for that, (b) you can do it from the comfort of your own home/bed/whatever, instead of reading fiction or watching TV or whatever else was your routine, (c) doesn’t cost anything, really, besides the cost of a call or a stamp, and if it’s an e-mail, it literally costs nothing. And it _matters_. Remember, local politicians largely can’t maintain constant polling in between election cycles to see what the voters think. How many letters / calls / e-mails they get on various topics is central to how they keep tabs on what the voters think, what they should speak out on, and what (if they’re craven) they should leave alone. So if you went all out and wrote a letter a week, or two letters a week, or five letters a week, that’s a *huge* impact for the causes that matter to you. That’s as many as _two hundred plus_ little bits of impact over the course of a year, for about as much time as you might otherwise have spent on Netflix. Sign up, write up, make a difference. I’ve signed up for the action lists of four organizations so far. I don’t have a fourth one for Fridays. I’ll keep an eye out for a good organization. Since today is Monday, I’ve looked at EFF’s action recommendations, and sent an email to my representatives encouraging legislation that would make publicly funded research publicly available sooner, and signed a petition to encourage Universities to stop selling patents to useless patent-collectors. I haven’t received confirmations that I’m receiving emails from PPH, ACLU, or Sierra Club, so we’ll see if they come in. 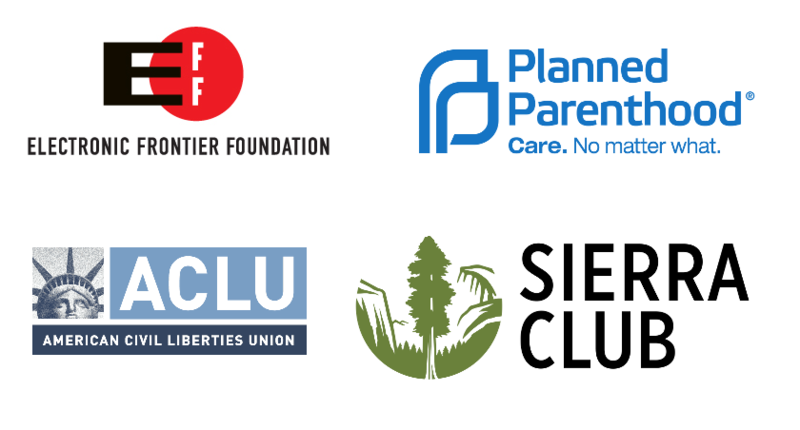 To be clear, I don’t agree with everything these organizations are fighting for, but I do agree with a lot of what they are doing. Also, we are giving regularly to most of these organizations already. For accountability’s sake, I may post a weekly summary of the issues.